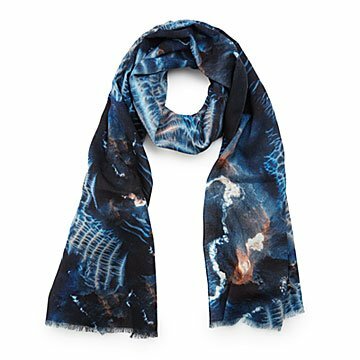 This stunning, spacey scarf is digitally printed with an enchanting image of Martian sand dunes. Created by two stargazing Parsons graduates, Ali Bennaim and Ximena Chouza, this design brings the natural wonders of the Martian landscape to a soft, lightweight wool scarf. Their inspiration comes from a desert 54.6 million kilometers away—the intricate pattern of sand dunes on Mars. The incredible image was taken by NASA's Mars Reconnaissance Orbiter, which has studied the history of water on the red planet. Digitally printed with this enchanting, extraterrestrial image, the scarf is a stunning statement that lends astronomical elegance to your ensemble. Made in China. Ali Bennaim and Ximena Chouza are two space-crazed Parsons graduates bringing the marvels of the universe to handcrafted, carefully designed garments. Each piece is digitally printed with real images from nature and space, many from NASA's Hubble Telescope, which captures vast networks of gas clouds and star clusters thousands of light years away. Based in Brooklyn, the starry-eyed pair source and produce almost everything locally. They also employ a waste-saving technique, carefully designing every garment to utilize almost every inch of fabric and leave next to nothing for the landfill. Although these young designers have lofty ambitions, they'll never forget their earthly beginning and aim to remain environmentally conscious. Visit the blog to learn more about Ali and Ximena! When I want to keep my neck warm in a v neck sweater; dress up an outfit; feel special!